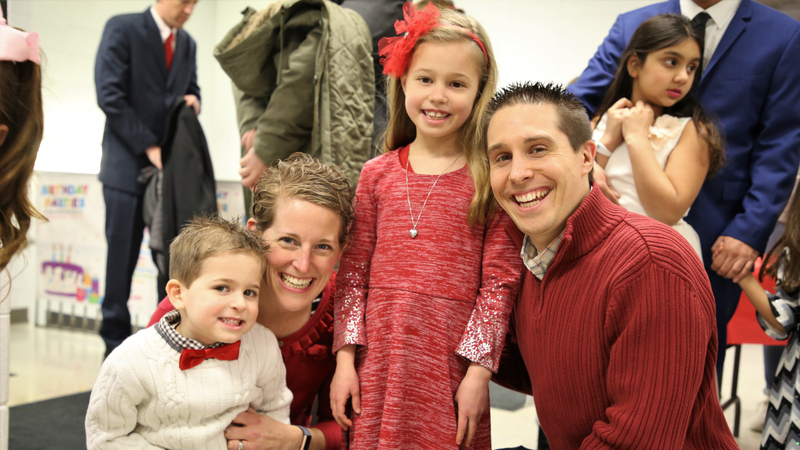 On Thursday, February 7, Palatine Park District hosted the sold-out annual Date Night event for families. The event for parents and children ages 3 to 12 was held in the gym at Birchwood Recreation Center, 435 W. Illinois Avenue, in Palatine. Attendees were invited to come dressed for the Valentine’s theme to enjoy a night of dancing and dining. Grade Power Learning of Palatine was the presenting sponsor for the event. Additional support for the event included Air Expressions, who provided the balloons for the event and d’Vine Wine & Gifts, who donated sparkling grape juice. iStar Photo Booth helped provide lasting memories to participants and the DJ from DJL Entertainment kept the excitement going throughout the night. Dinner was catered by Pizza Bella, and included salad, pasta, garlic bread, pizza, and dessert. Registration for Date Night opens with winter program offerings in late November or early December each year and has been a sold-out event in recent years. To register early for Date Night, look for the winter 2020 program catalog mailed out to residents mid-November. Visit palatineparks.org for updates and to join the District’s email list. For more information about Date Night, contact Special Interest Coordinator Lisa Schroeder at 847.496.6347 or lschroeder@palatineparks.org.